Ho ho ho! 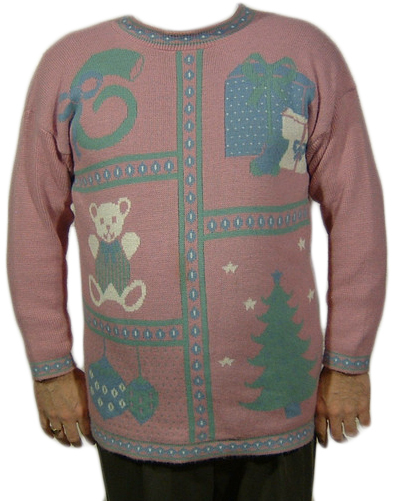 Is that Santa Claus I hear, or the sound of someone gagging in sweater-induced horror? Hopefully both! 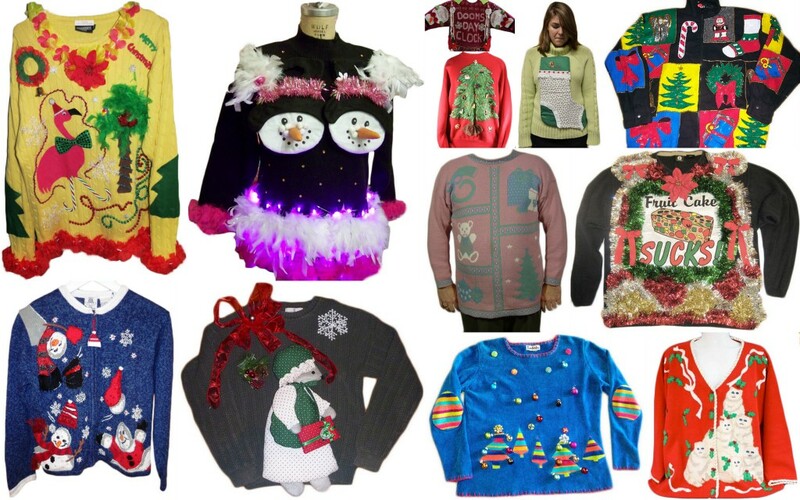 We’ve scoured the farthest reaches of eBay’s frightening holiday inventory and dredged up 12 ugly Christmas sweaters even worse than the ones we posted in 2011. This year, the hand-crafted DIY aesthetic has clearly left its mark (scar?) 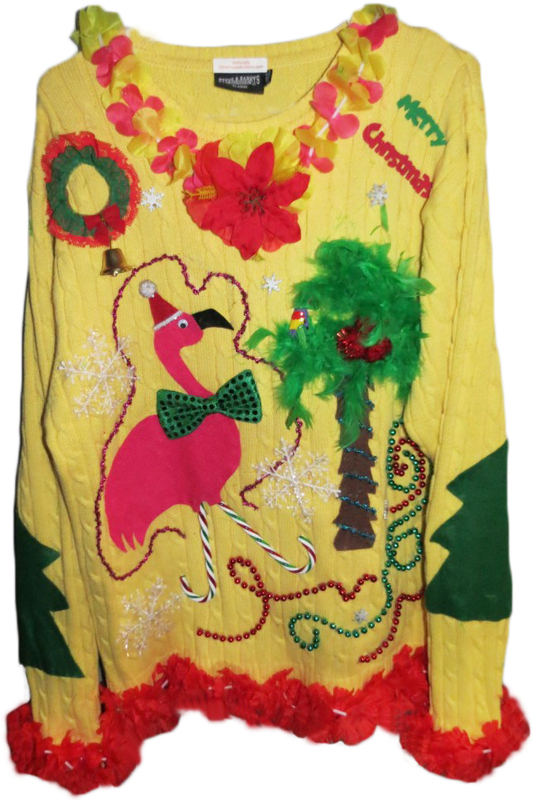 on the Ugly Christmas Sweater market: More people bedecked and be-tinseled their own tacky outerwear than ever before, giving us some brilliant one-of-a-kind gems to choose from. So don your gaudy gay apparel and get thee to a holiday party. 12. Sick of all that red and green? Throw on some Pepto-Bismol pink! This doozy’s hospital wall-art aesthetic really works to unflatter that figure. Disembodied hands not included. 11. 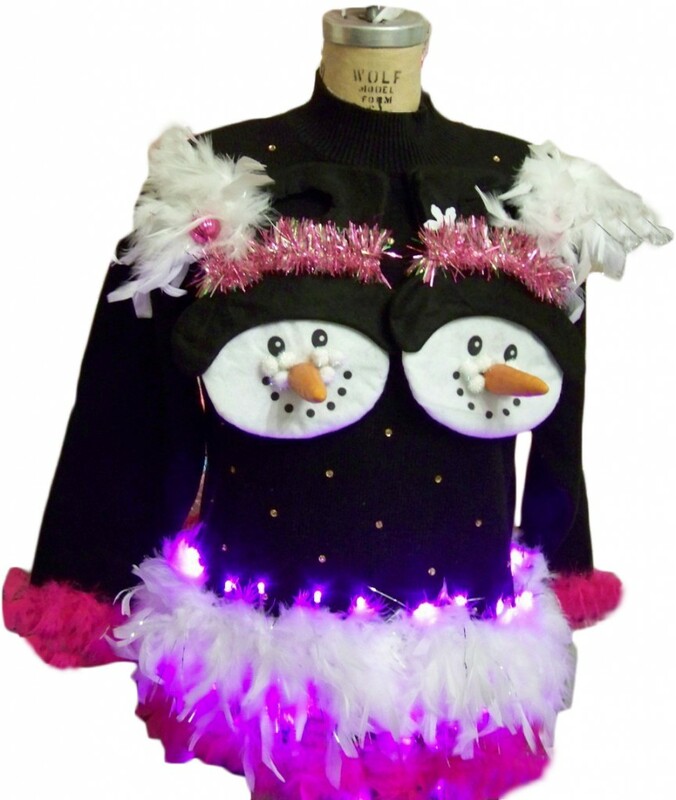 If they won’t let you drink at the office, protest by wearing a sweater with sloppy snowmen all over it. The zipper-pull shaped like a winter hat really adds a level of tacky your co-workers are sure to love/hate. 10. 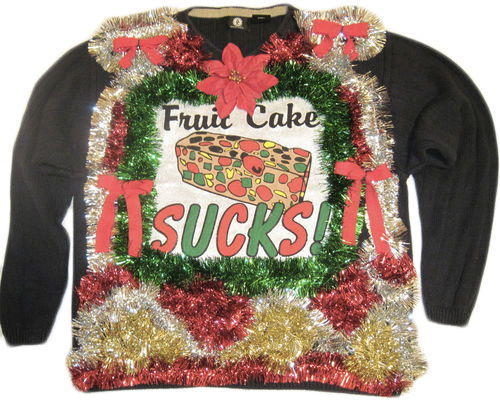 The anti-fruitcake coalition is finally getting organized, and the proof is on this eye-catching piece of wearable art. Wow. Just wow. 9. Sick of the limelight? Try blending in by dressing like a piece of holiday decor. 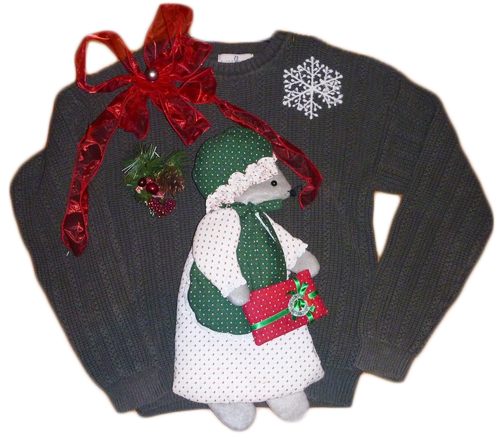 Sweaters festooned with big fat Christmas trees are really slimming, too. 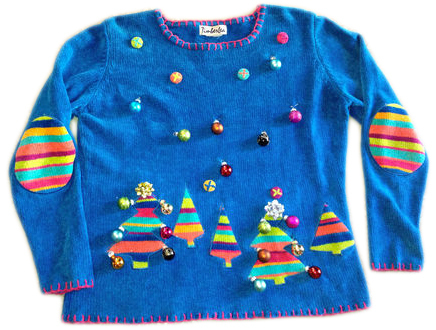 8.On first glance, this sweater doesn’t even seem Christmas-themed because of its incredibly garish late-’90s color scheme, but the detachable mini-ornaments seal the deal. Extra elbow padding comes free with purchase. 7. If you’re into nontraditional holiday celebrations (shots of eggnog taken off the bare chest of a reindeer, for example), you might enjoy this sickening tropical nightmare. 6. 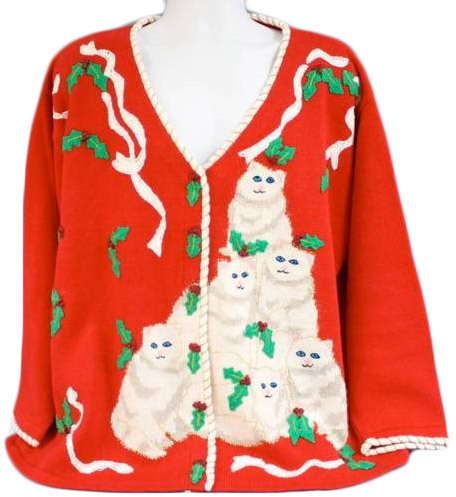 Cats boost the ugliness of any Christmas sweater, but this unblinking pile of zombie kittens really takes the cake. 5. Poor Betty. 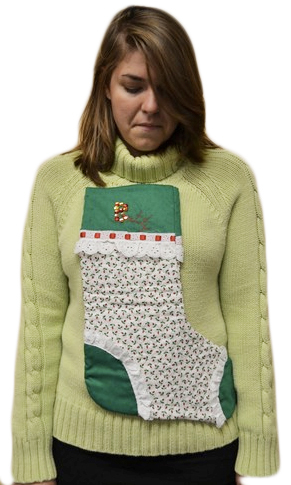 Beyond the clashing greens and unfortunate giant sock on her sweater, she looks like she might be sick. I think she might have stuffed her stocking a little too full of spiked cider last night. 4. This grinchy pullover looks like it was decorated with last season’s Christmas wrapping waste and discarded stuffed animals. Pure yuck. 3. Schoolteacher pizzazz gone bad! 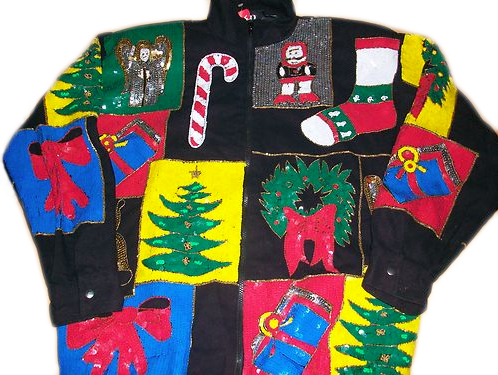 This ugly sweater has more sequins than anyone needs in a lifetime. 2. 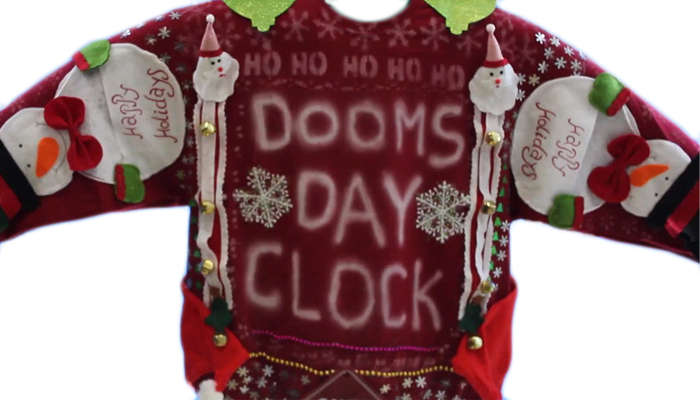 This season offers the once-in-a-lifetime chance to wear an ominous Doomsday Clock sweater. This monstrosity is sure to be a collector’s item come December 22, 2012. If we all survive, that is. 1. Simply appalling. 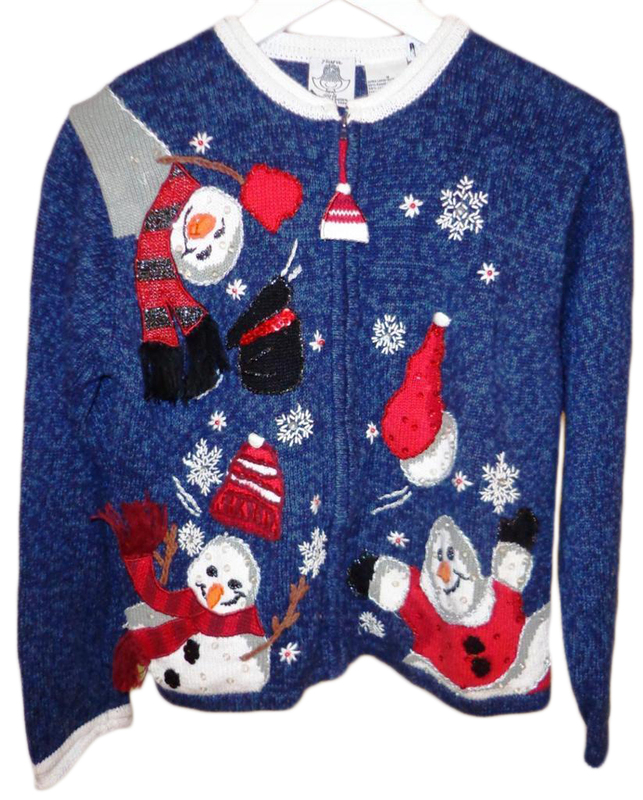 In fact, this Gaultier-inspired snowman top is so bad, it wins our acclaim as the ugliest Christmas sweater of 2012. Merry Christmas! 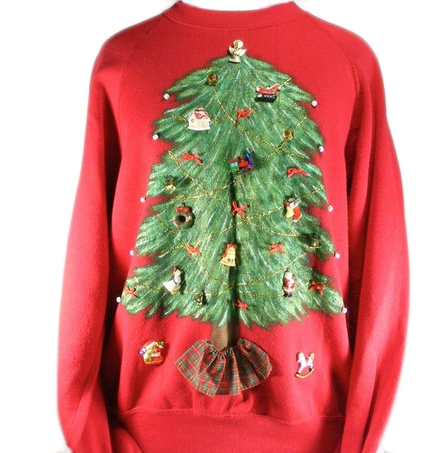 Friends do not let friends dress in ugly Christmas sweaters. Too funny. A guaranteed LMAO with every sweater. Really, what were these people thinking once they put them on? What were the clothing manufacturers thinking when they made these atrocities? Friends don’t friends dress in such hideous clothing. Where’s Stacy & Clinton to destroy these atrocious sweaters? Well, Zombie Kitties and Doomsday Clock Sweaters have a certain appeal for me, but then I’m kind of twisted…I do like the tropical-themed item! “ ” We all have garments that we’ve kept a long time. It’s often because it reminds you of your mother or a special time or an experience you had.